Help farmer Bob delight the children with tasty new snacks! Farmer Bob has a farm where he grows grains and harvests fruits to make cereal bars and crackers. From his farm he can see the neighboring school. Whenever the children open up their lunch boxes, he’s disappointed to find that their snacks are too boring to eat. 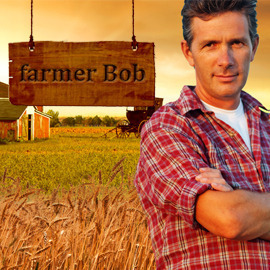 If only farmer Bob knew how to use his grains and fruits combined with other nutritious and delicious ingredients to create a new, tastier and more fulfilling snack for children… Help farmer Bob create a new, healthy yet tasty and fulfilling snack that children could eat at lunchtime or during recess, starting with the wholesome ingredients from his farm. Format: Presentations with pictures or illustrations and text.